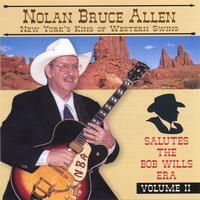 WESTERN SWING MUSIC KING OF NEW YORK, NOLAN BRUCE ALLEN (NBA) began his professional career in the 1960's. While serving our country in Korea he played lead guitar on Army broadcast country music radio shows. Later in Europe he with his Army bands maintained a grueling schedule of performance dates at Enlisted Men's, Non-Commissioned Officers and Officers Clubs for nearly 3 years, often opening shows or providing direct backing for Grand Ole Opry stars and other Artists booked from America to entertain our Troops. NBA began playing western swing in the early 1970's after becoming fascinated with Bob Wills era music, finding its unique blending of Jazz, Country, Dixieland and Big-Band extremely contagious. Add its 2 and 3 part harmonies on guitars, fiddles, horns, hot solos, dynamic rhythm, lovely, romantic, ear-catching and sometimes humorous melodies - well, he was hooked! He records in Dallas, Texas at the historic A.S.C. Sumet Studios (where Bob Wills cut his "For The Last Time" recordings)utilizing the very best and most experienced Western Swing Musicians available today including Tommy Allsup - Grammy winner and present-day Bandleader of Bob Wills Texas Playboys, Grammy winner Chris O'Connell, Maryann Price and Tim Alexander - all three toured and recorded with Asleep At The Wheel about 15 years each, Tom Morrell - Hall Of Fame Steel Player and Producer, Rich O'Brien Producer, Artist and session guitar player, Randy Elmore, 3-time world fiddling champion, Mark Abbott - Artist and former Bassist of Bob Wills Texas Playboys, Greg Hardy - Artist and Drummer, and Bob Myers - Hall of Fame Saxophone/Clarinet player to name some. NBA's father was a Baptist Minister, Sharecropper and contest-winning fiddler. His Mother and most of his 9 brothers and sisters play and/or sing. Born in Alabama, he bought a vacation home/office there in 1993. After being honorably discharged from the Army (eventually receiving a total of 16 medals) he settled in upstate New York, currently living in the Niagara Falls-Buffalo area and conducts most business from there. NBA performed over 200 dates annually until the dramatic growth of his equipment leasing company and other business ventures forced him to cut back. Currently he does 25 - 35 dates annually with plans to add more. In addition to thousands of individual performances with his Lone Star Band he has over the years frequently been featured on the same shows with Patti Loveless, Ernest Tubb, Merle Haggard, Faron Young, Tex Ritter, George Morgan and Hank Thompson to name just a few. He radiates Western Swing music. NBA's recordings are of absolutely superb quality. Clean, innovative and driving with lots of modulations, and nicely spaced harmonies - big-band western swing styling in pure, true and sweet form. His tasteful use of horns is incredible! Arrangements are impeccable and well thought out, his easy listening style very enjoyable. This man IS western swing! NBA loves people and entertaining them. Extremely successful he has that certain something about him that makes people feel good about themselves. Kind, thoughtful, courteous, gracious, compassionate and generous are words that describe him to a "T". He cares immensely for children, donating 40% of net CD/Cassette earnings to The National Center For Missing & Exploited Children. And did I mention he's a performing member of the Academy Of Western Artists of Gene Autry, OK and Western Swing Music Society of the Southwest, Seattle, WA? Or that I and other of his New York music peers dubbed him "New York's King Of Western Swing" in the mid-1970's? The name stuck. NBA's love of Western Swing is obvious in the feeling he puts into each song and the time and planning that goes into every arrangement. Friends (and fans) are very proud of how he overcame humble beginnings (his early background is quite similar to that of Bob Wills) to reach the stature he has today... a successful businessman and NEW YORK'S KING OF WESTERN SWING! You've got to hear his music! His Bob Wills Era Salute Vol I is nominated for Academy Of Western Artists 2002 Album Of The Year! By the way, I am his long-time close friend, Bass player and band front man. Enjoy.